DESCRIPTION: Wrapped in beautifully stitched and quilted leather this Bryant slim card case from Tory Burch is bohemian-prep at its best! 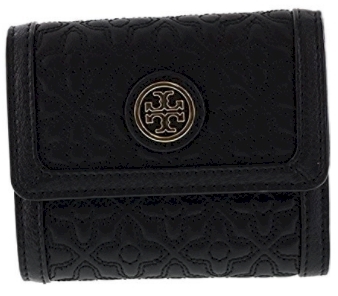 The front is accented with Tory's iconic double T stacked logo medallion in polished hardware. The custom fabric interior features a center card slip and (2) card slips on each side. It measures approximately 4.25 inches (L) x 3 inches (H).